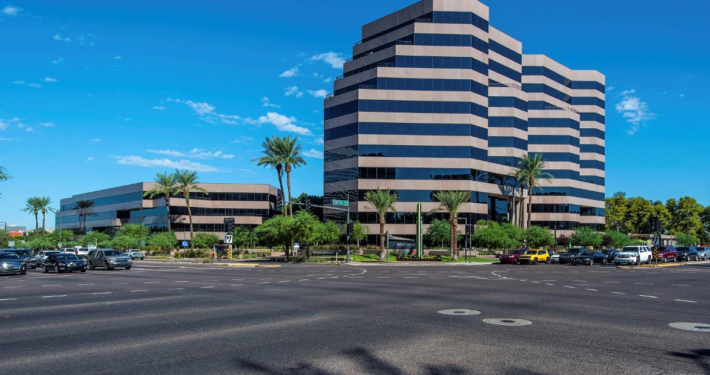 ViaWest and Alliance Bernstein (now Prospect Ridge) acquired Biltmore Financial Center, a three-building, 635,409 SF office complex located at 24th Street and Camelback Road in Phoenix, Arizona in July 2015. Despite being located in the heart of the Camelback Corridor, the project was tired and in need of repositioning, with outdated finishes and an occupancy rate of 71%. After implementing significant physical improvements to the common areas, implementing a spec-suite program, and executing a thoughtful rebranding campaign, the building was re-established as Biltmore Center – an amenity-rich, tech-friendly environment highlighted by inviting outdoor space, a best-in-class fitness facility, and an innovative café concept within a tenant lounge. These efforts led to immediate results, as ownership saw a 28% rental rate increase and completed over 200,000 SF of new leases over a 3-year period, taking occupancy up to 94%. Biltmore Center was previously considered an inferior office project on the highest-profile commercial intersection in Phoenix, but through this transformation has become the building of choice, offering the premier tenant experience in the Camelback Corridor.